A beautiful and truly unique engagement ring design handcrafted using an array of opulent precious materials. 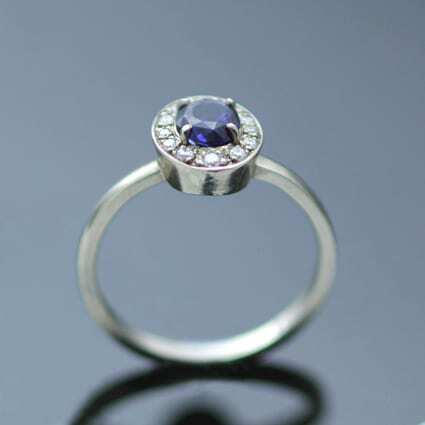 This stunning handmade ring showcases a gorgeous 0.7ct Ceylon Sapphire centrepiece, surrounded by a Halo of pave set Diamonds set in solid 18ct White Gold. 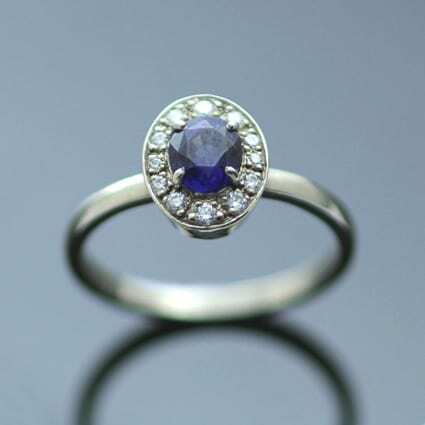 This special engagement ring has been handcrafted by Julian from his Brighton workshop, hand finished with a high shine polished effect for added sparkle. This timeless engagement ring also bears Julian Stephens’ exclusive Maker’s Mark and a Hallmark.